Among connoisseurs of '40s thrillers, the name Robert Siodmak garners the highest of respect. With such seminal crime dramas as Criss Cross, The Phantom Lady, and The Killers to his credit, Siodmak forged a body of work notable for its sense of psychological and physical corruption. However, because his career in America was relatively short, recognition of his name among many moviegoers is virtually nonexistent. Siodmak's career began in Germany. His most famous early film is Menschen am Sonntag (1929, American title: People on Sunday), made in collaboration with Edgar G. Ulmer (who would direct several fine B movies in America, including Detour and Bluebeard). This film is very nearly a who's-who of German filmmakers who would soon emigrate to America to avoid the Nazi takeover, including Billy Wilder and Siodmak's brother Curt as screenwriters, while Eugene Schufftan and Fred Zinnemann collaborated on the cinematography. With the growth of Nazism, Siodmak left Germany for Paris in 1933, where he continued making films until German troops marched into Paris in 1940. His first few years in America were spent in low-budget films, with Son of Dracula (starring Lon Chaney Jr.) as the standout. By 1944, he began helming more prestigious productions, such as The Phantom Lady, a first-rate suspense yarn based on a novel by Cornell Woolrich, and Cobra Woman, an exotic (and delighfully kitschy) fantasy programmer starring Jon Hall and Maria Montez. 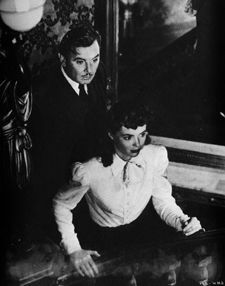 George Brent and Dorothy McGuire in The Spiral Staircase. 1945 is arguably Siodmak's greatest year. In quick succession he created a Hitchcockian thriller starring Charles Laughton, The Suspect; a melodrama of frustrated love starring George Sanders and Geraldine Fitzgerald, The Strange Affair of Uncle Harry; and one of the silver screen's finest chillers, The Spiral Staircase. Now available on DVD from Anchor Bay Entertainment in a beautiful transfer, The Spiral Staircase tells the story of a young woman, Helen Chapel (Dorothy McGuire), mute from childhood, who works as a servant for a wealthy family. In the nearby town, a series of murders baffles the police. The movie opens with the killer's third murder: as Helen watches a silent movie in a hotel theater, the killer strangles a woman upstairs. All the murdered women share a common trait: they were all handicapped--which indicates Helen could be a potential victim. Helen's employer, Mrs. Warren (Ethel Barrymore) warns Helen to leave the Warren mansion: "Leave this house tonight if you know what's good for you." Seriously ill, Mrs. Warren is confined to her bed, but she senses an evil force in her house. Several possible sources of that evil are offered: Mr. Oates (Rhys Williams), the groundskeeper, stalks Helen when she approaches the mansion during a storm; Steven Warren (Gordon Oliver) is a womanizer with a mysterious past; Professor Warren (George Brent) is a scientist who writes scholarly books. He despises his brother Steven's lifestyle. Could any of these men be the killer? Or is it someone outside the Warren estate? Much of the story takes place within a wonderfully ornate Victorian style mansion (constructed entirely within a studio lot). Cinematographer Nicholas Musuraca's camera prowls the hallways and basement with a particular fondness for shots with great depth of field. When Helen approaches the Warren grounds, Musuraca places the camera low so that it emphasizes a wrought iron fence. Lighting from inside the fence casts wonderfully eerie shadows on the pathway as Helen walks to the front gate. This is a gorgeously photographed movie with meticulously crafted lighting schemes. Musuraca was one of the great cinematographers. He frequently worked in low-budget films, such as the films of Val Lewton (e.g., Cat People, The Seventh Victim, and Bedlam). He also filmed the archetypal film noir classic Out of the Past. 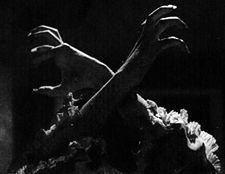 A woman's hands contort as the killer strikes in The Spiral Staircase. The Spiral Staircase is more than just a well-photographed thriller. It also features a strong screenplay by Mel Dinelli based on a novel by Ethel Lina White. The screenplay creates several fine supporting roles and Siodmak show remarkable ability in handling actors by making sure these characterizations don't get overpowered by the movie's suspense. Elsa Lanchester is wonderful as a cook with a hankering for bourbon. James Bell is excellent as the wise but slow-talking town constable. And Rhonda Fleming gives a good performance as a secretary who succumbs to Steven Warren's charms. The only disappointing characterization is the new-in-town doctor portrayed by Kent Smith. Smith was a capable actor (he gave one of his best performances in Curse of the Cat People), but asked to be a romantic lead (he conducts a modest courtship of Helen in The Spiral Staircase), his acting becomes forced and artificial. Meanwhile, George Brent delivers an exceptionally strong performance as the level-thinking brother who is always in control. Siodmak would continue making several fine films over the next seven years, turning out such classics as The Killers and Criss Cross. But by 1953, the call of his homeland proved too strong. He ventured first to France and then to Germany, where he continued making movies until 1968. 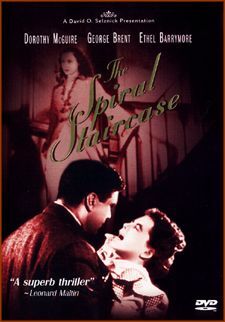 This DVD presentation of The Spiral Staircase contains no extras other than a rather worn theatrical trailer from the movie's theatrical re-release in the '50s. However, the video transfer for the movie itself is superb. This is a magnificent looking DVD with great detail and sharp imagery. The Spiral Staircase is now available on DVD from Anchor Bay Entertainment. Suggested list price: $24.99. For more information, check out the Anchor Bay Entertainment Web site.